This is one of my favorite places on the Lake. First, the beers are awesome. Second, if the weather permits, you can sit out front in their oversized picnic tables and swing your feet as the traffic goes by. 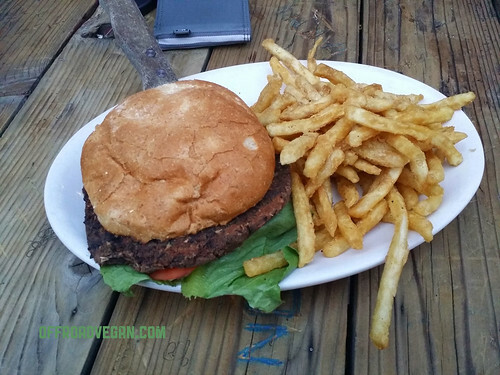 Third, they have an awesome vegan burger (house made) and great hop-salt fries. 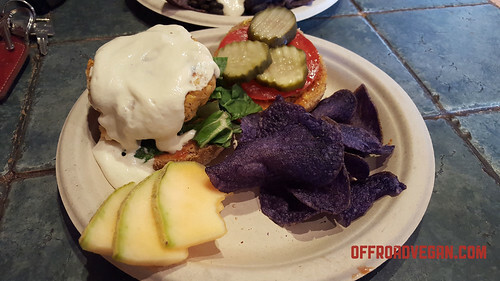 Sadly, this burger (or any vegan option, really) no longer exists at the brewery. This is really sad/annoying. But I am leaving this business featured here in the hopes people will continue to ask for a vegan option and hopefully they will! The beers are still great. While their website leaves a lot to be desired, check it out anyway. Looking for something quick and good? 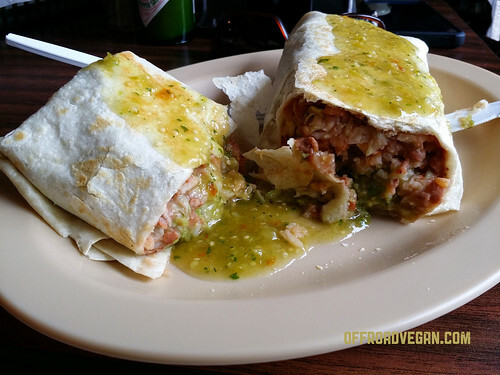 I found a GREAT burrito at Jalisco Grill that was cheap and quick. While no menu item is vegan, I was able to hack together a burrito with black beans, rice, lettuce, toms, and salsa. It was simple, relatively healthy, and a fulfilling meal while my meat eating friends dined on animal parts. I couldn’t believe my eyes when we stumbled across the Simple Bliss Vegan Cafe. 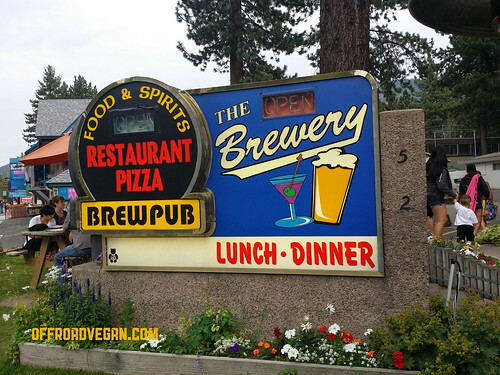 A dedicated vegan joint in South Lake Tahoe!? I will save a full reiew for the coming days, but if looking for some great food and vegan selections, be sure to hit it up. My “classic burger” based on Lentils. Super good! The burgers seem good, and the nachos were amazing. In all honesty, the service was weak and the coffee was a little weird (cashew milk latte). 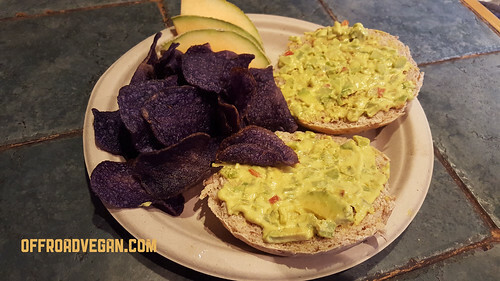 But for a full on vegan establishment in Tahoe, it is a great spot, albeit a little spendy. If you are taking a “left” at the end of Rubicon-McKinney, heading North on 89, there are some options as well. The Dam Cafe was a great stop for breakfast on our way out of town. I was surprised at the “Veganrito” on the menu which is a basic vegan burrito with “Costa Rican style rice and beans,” avo, and the basics. Their coffee was also pretty good (Illy) and they offer soy and almond milks. They also offer “veggie sausage” but I didn’t ask if it was vegan. Apologies for no photos, but we were on a tight schedule! While I didn’t make it into the Fire Sign Cafe this last trip, some friends of mine did and they raved about the vegan options. The following morning (a Saturday) we attempted our own visit but the popular brunch spot was flooded with long waits and a full parking lot. So maybe next time. Looking for a place to crash? Check out Tahoma Meadows in Tahoma. A great little B&B right off the highway that does a fantastic job of catering to us pesky vegans. 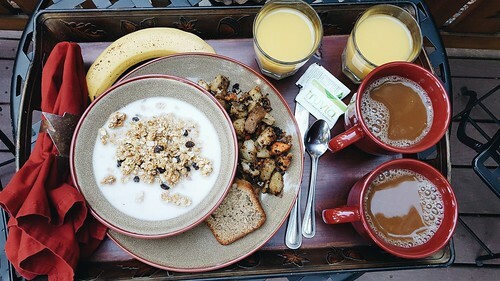 While each morning is different, they have granola and cereals with almond milk and their breakfast potatoes (while amazing) are also vegan. Our tray on the first morning. The staff at Tahoma Meadows is also incredibly welcoming and warm!!! There are many places that show up on Happy Cow that I will check out each time we venture to the Rubicon. I’ll update this post!